Pewter Animal Figurines - Horses, Dogs, Eagles and Many Others! Pewter animal figurines are commonly found. In fact any kind of animal figurines are available, from plastic, wood, glass, bronze... you name it. In Asia it is very common to find figurines of the twelve animals in the Chinese zodiac system. These animals are the rat, ox, tiger, rabbit, dragon, snake, horse, goat, monkey, rooster, dog and pig. The dragon is actually a mythical creature and a highly revered one too. In fact I created a page just for pewter dragons since they are so popular. By the way, 2009 is the year of the ox. Incidentally, most economic crisis in the last few decades have happened when the ox is around. Here it goes - stock market crash in 1973, global recession in 1985, Asian financial crisis in 1997, and now the Great Recession of 2009 (well, this actually started at the end of 2008 but we're feeling the full impact in 2009). Back to pewter animal figurines. I haven't yet got any pewter figurine of the twelve animals (unless you count the dragon, of which I have). 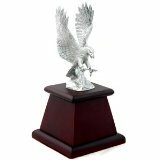 But I do have a pewter eagle. The picture is below. I got this pretty cheaply in a flea market and it's still in a very good condition. It's about 12 cm tall from the base to the tip of the feathers. I like it as it captures the eagle in fiery action mode, looking as if it's about to grab a prey. It's not the most finely detailed figurine I've seen (I thought the feathers could have been much better detailed), but it's still a great piece to have. I have seen a few other pewter birds since, but these were merely perching on something and there was no action. 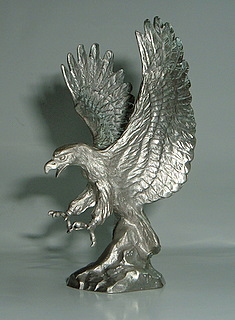 By the way, I also found that this same pewter eagle is available for sale online. But instead of just the figurine itself, it is actually sold mounted on a wooden base. I personally don't fancy my figurines on wooden bases, but that's just my taste. You can judge for yourself whether the base is an enhancement. Besides the pewter eagle, I also have other animal figurines. You can check out my pair of pewter otters, pewter koala, and pewter owl figurines. I'm always on the lookout for great pewter animal figurines. I was born in the year of the ox, so that could be my next target. If you're an animal or pet lover, why not get one and put it on your desk. It makes your desk more interesting. At the very least you will have a cool paperweight to keep those papers from flying everywhere! You can also check out other pewter figurines on this site.